WordPress widgets are amazing as it is one of the most preferred option to add social sharing icons in a website. Some WordPress themes offer more widgetized areas compared to others giving you more room for adding your favourite widgets. Plugin for WordPress can have widgets, shortcodes or both. Widgets unlike shortcodes have limited placement options as widgets either go in sidebar or in widgetized areas provided by your theme. If you want to place your share plugin in a certain location then shortcodes will be the only option. But unlike widgets which can be customized in live customizer, shortcodes must be manually placed in your code and it is a bit advanced for a new blogger. Shortcodes can also be placed in text widgets which comes with WordPress which makes it a great feature to have. We think its wise to choose plugins which has both of them. Social sharing is no more an alien word; in fact, people are sharing more every day. If they find your content or picture is interesting then visitors are definitely going to share. With more shares come popularity and with acceptance, you earn more in your business. You can make it easy for your readers to share your website or content articles by adding social sharing icons in your website for which you need a good plugin. Although there are hundreds of plugins out there and one of which you could pick for yourself – trial and check way! But switching plugins is not a good idea. WordPress sure has the right social share plugin waiting for you and today we are going to help you find the right one for you. Here is a list of 26 cool wordpress social sharing plugins which are going to make your website fun to share this year. So who use these plugins ? Anyone who is interested in marketing their business through social media networks. Also check our topics on 35 Best WordPress Social Media Plugins and 10 Best WordPress Social Content Locker Plugins. Dive in & let us know what you find. The Monarch is a popular social media plugin that lets you customize and manage your content sharing, followers, page likes fast. This plugin helps you in getting more followers on social networks; Twitter and Facebook. Monarch uses unique ways to attract viewers such as flying boxes, inline sharing buttons, pop-ups and social sharing sidebars. There is a bundle of sharing solutions included with this plugin that helps in attracting the attention of a customer. You can embed links to your social profiles and show the total number of followers from these profiles inside your sidebar with the social follow widget. Monarch makes sharing easy like never before. Not Enough ? Need more followers and shares fast ? Automatic popups and fly-in bars are just for this purpose. Trigger a popup when the user is exiting your website or browsing through a certain location on your website. Create timed delays so popup appears after a time interval you have set. Promote your content and socialize with this premium plugin that is unique in every way. With this plugin, your blog or website is never going to be slow as it is well optimized. You can pick from minimal social media icons or buttons with share count. If you are not a technical person then you can use the plugin dashboard to customize the look of the icons. If you are well taught with front end development then you can further as the plugin has custom CSS that let you add your own styles. Analyze your social activity from the settings panel of this plugin as this gives you insight on your daily likes, shares. The floating social bar and popup triggers will increase your social profile engagement. This is one of the top plugins who should have. It is a very popular social plugin for wordpress website that is available for free and translated to seven languages besides English. Super Socializer offers social sharing for more than 100 social networks. You can specify the shape, size, logo and background color of the icon. There are two options for layout – vertical and horizontal. It allows the users to link their social accounts with your website or blog. The plugin comes with shortcodes and widgets for social comments, login, like and share buttons. Super Socializer is compatible with Woocommerce products, bbPress Forums and BuddyPress. It supports social login from 9 leading social sites – Instagram, Facebook, Xing, Twitter, Steam, Google, Twitch, Vkontakte and LinkedIn. The URL shortener service and target URL customization are great for sharing website links many times. A regular share button lets you share the content you like with a link. But Tweet This has something more in it, you also get to write a message with your share which is embedded into the page or post in a striking way. On clicking the embedded message the reader can send the message with a link to your post like a tweet. You could bring out the writer or poet in you. Write your quotes and let the world admire your text too. There is a simple shortcode that lets you tweet the text from wherever you like. This plugin is an impressive way to display a Facebook Page like icon in your sidebar. Besides a striking icon, it is also simple to use and lets you do more in the admin widget panel. The simple drag and drop function makes it easy for any novice to use it. Add your application id which you can get from the Facebook developers page and you are all set to have likes for your Facebook Page. Some other options which you get in the plugin are Data Stream display and show your fan faces etc. Advanced Control: Yes, through Widgets panel. This is a remarkable plugin that has over 100 social sharing icons all which are simple looking yet optimized share buttons. Sassy Social Share also offers bookmarking services and has some of the most attractive vector designs. It is free to download plugin and the designer has included documented screenshots so you don’t face problems while installing it. It is responsive and scalable which means they look perfect in all types of device sizes and are great on Retina and Retina HD displays. The lightweight code of the plugin ensures that it loads faster. Other interesting features include url shortener service and customization of sharing url. Widget: Yes, Floating and Standard. Besides having share icons of social sites such as Twitter, Instagram, Facebook, LinkedIn etc Social Media and Share Icons has icons of more than 200 social media websites. You could select the ones of your choice from this wide range of beautiful icons that come in 16 designs. Use one button for many functions such as linking to your social profile and the option to like the page too. These quirky icons come with many animations; mouse over effects or auto shuffle etc. Animations increase the chance of your viewers to follow you or share your work. You could have your icons ‘sticky’ or floating social bar. Embedding these beautiful social sharing icons in your website or blog will help you attract more visitors. You have the option to display and hide these social icons and even change their color to match your website color scheme. The icons are responsive, you also have the shortcode support. Social sharing icons for Google +, Twitter, Email, VKontake, Reddit, Pinterest, LinkedIn, Facebook, and Pocket are available with this plugin. It also lets you share counts for social websites such as LinkedIn, Twitter, Google + and Facebook. Because it comes with caching it enables your website to load sooner and reduce the server load. You get the option to upload your own icon and set your own social icon displayed horizontally or vertically. There are no built-in social icons which come with this plugin, you will have to upload your choice of social icons after which you can make use of this plugin. After that, you can set up the URL for the specific icon or targeted website. You can create and place shortcodes in posts and page, widget instance and PHP template tag in PHP themes files with various settings. The plugin gives you the option to add or delete social icons, insert them in pages or posts or set them in the side bar. We all know ‘old is gold’ – Max Buttons are the first set of social buttons that many used on WordPress websites and they are still going strong for more than four years. The plugin gets updated at regular intervals and the developer’s offers support if required. These are responsive CSS3 buttons that are simple to use on any page or post. There is no coding required and it comprises of five sets of social sharing buttons which you can configure. You have the option to create any number of buttons with it and use the color scheme of your choice. Widget: No, but possible through Shortcodes via text widget of wordpress. A free to download social share WordPress plugin from AccessPress. Social Share lets you share images, pages, media, and posts of your websites to Twitter, Digg, Google+, Facebook, LinkedIn and Pinterest. Reaching out to the world is much easier with these icons as you can place it anywhere on your WordPress blog through shortcodes. There are five themes that are available with this plugin. There are options to choose the social media profile that you want and the display order of the social media. Although most of the features are free with a premium version that gives you more features. Widget: No, Use Shortcodes in text widgets. Simplicity at its best! There are only five icons in this plugin. Everyone is aware that most of the posts; around 99% of it are shared on these top four social networks– LinkedIn, Twitter, Facebook and Google+1. The plugin supports vertical scrolling as the social bar floats with page scroll. It has shortcodes that let you embed the social icons in any part of the page on your website. There is a complete set of guidelines on how to use shortcode function to display the social buttons. Every upgrade makes this plugin even better. Social Media Plus can be translated in other languages than English, a quick email to the support will have your job done in no time. The plugin is completely free to download and use. There is a huge range of more than 200 social icons which are available in this plugin including YouTube, RSS, Email, Facebook, Twitter, LinkedIn, Instagram, etc. You have different choices of placing your icons; before the posts, next to the posts, on the homepage. There are a set of 16 designs of social share icons. Social Media Plus is easy to use plugin that is loaded with wonderful features and identical to ultimate social media icons mentioned above. The plugin has a set of striking social share icons which are definitely going to attract many viewers and increase engagement on your website. There are more than 15 social networks and the social buttons are responsive. Use shortcodes provided by this plugin to add share buttons in the location of your choice. The design and configuration of the social buttons are simple for anyone to use. The designs are customizable and you could also add animation effects to them. You have the option to select when the social buttons should show up; for instance when the user clicks on the page or as the page loads, or exit intent etc. Cresta Social Share Counter is a simple plugin that supports social share for Twitter, Facebook, Pinterest, LinkedIn and Google Plus. There are nine styles of buttons which you can select from. You can use animation for the buttons for a better effect. Place the social buttons before or after the page or post content. Share your articles without much hassle with this free plugin. An easy shortcode enables you to display the social buttons in the place of your choice. 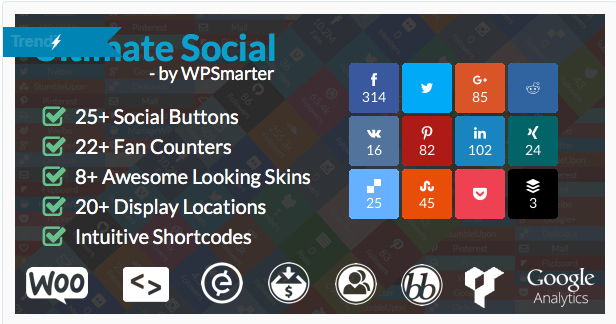 Cresta Social Share Counter is a free to download WordPress plugin which is easy to use. This is an amazing plugin that generates accurate and complete meta tags and Schema markup for your website. It generates all the information needed by search engines thus improving your Google ranking and social engagement. The plugin supports many languages. Adds open graph, twitter card meta and many other metrics without conflicting with other WordPress SEO plugins like Yoast. There are more features which come in the premium plugin you can try. With this premium plugin Social Share, you don’t have to worry about your website’s/blog’s sharing. The plugin has great social sharing icons which give you 13 social networks. You also have the option to quick share your blog posts to even Tumblr and email. You don’t have to be an expert to handle the plugin, it is easy to setup and install. Customizing the icons could never have been easier with Social Share around the corner. The buttons are round, square, animated and you can use hover effects which are beautiful to look at. Ultimate Social Deux is a paid plugin which has many features and options for your website. The plugin is compatible with all modern browsers and there is support for plugins such as WooCommerce, Layers WP, BuddyPress and Aesop Story Engine. There are easy shortcodes included to place your icons anywhere you may like. They are also fully responsive icons and look perfect on any type of device. It has over 25 social buttons and 8 beautiful skins which you can select from. WhatsApp, Reddit, Tumblr, Facebook, Twitter and 100 more such social sharing icons are available in AddToAny. There is a floating share bar which is completely customizable, responsive and can be placed horizontally or vertically. Vector graphics make these icons scalable for all screen sizes. You can select the place where you want the icon to be and custom placement is possible through shortcodes. The plugin supports multisite networks and multilingual websites. You are not required to sign up or open any account while downloading or installing this plugin. There is an excellent customer support that is always ready to help in case you get stuck with the plugin. Social Media Share Buttons by MashShare is sure going to make your work easy. The icons are wonderful to look at and enable more shares for your website. The total shares of the article get counted by the plugin and it displays it with a big share counter. It is a free professional plugin where the icons can be customized according to your requirements. External scripts usually slow down a website which is not the case with this plugin. MashShare is not dependent on any type of external scripts. Widget : Yes, it shows most shared posts in Sidebar. This is the simplest plugin on the list as it takes just two minutes to install and setup. With the Pin It button your reader gets the option to pin any image uploaded in your post or homepage to Pinterest board. You can manually choose the images so the viewer can pin only them. Mention a certain image which could be pinned for each post. This social share icon for Pinterest sharing also has a pro version for more exciting features. Image Share: Pin button on image hover. This is a simple to use plugin which enables the social share icons on your posts because of the default settings used by Genesis Framework. It works great on genesis child themes and designed especially for it. If you wish to make changes all you need to do is to go to the menu settings. You could select which post types would be active for sharing. The advanced settings will give you options to change the icon sequence by just drag and drop. StudioPress maintains and updates this plugin regularly so you are not left out. This plugin is for webshopping and Woocommerce solutions. The plugin adds the social media share icons to the WooCommerce store products page. There is a simple shortcode using which you could use to add icons to posts, products, page, widget and events. There are four layout options which you can select. It has support for LinkedIn, Facebook, VKontakte, Pinterest, Tumblr, Twitter, Email, Stumbleupon and Google Plus social websites. Paying for advertisements are no more in the trend. Social share buttons let you save on that extra cash. Yet you should have a cool set of social sharing buttons so your visitors can share your content, here you get that. The plugin also helps in boosting the traffic of your website. There are some exciting pop-ups which engage with your visitors and increase the shares. There are no codes needed for the installation and your page load speed is not affected with this plugin. It features mobile share and follow bar which is for mobile users. Blogging has become most effective way of connecting to your customers. Every business has a blog where they share unique content to the public. Personal blogging also has grown a lot as there is a high scope of making money online for anyone through affiliate marketing these days. SEO Plugins as itself can only do a little to your blog but when you combine it social media plugins your business will start to grow. Promoting your content to social networks is one of the key success metrics for search engine rankings in 2016.